Each Christmas I endeavour to create a special Christmas card for my sister. Last year time and my imagination failed to do this so as November comes to a close I know that it is time to getting thinking and digitising if necessary so I can create a unique card that she will cherish for 2014. I know that she puts all my Christmas cards out each year so I began to think what unique card I could make this year so she is not disappointed. 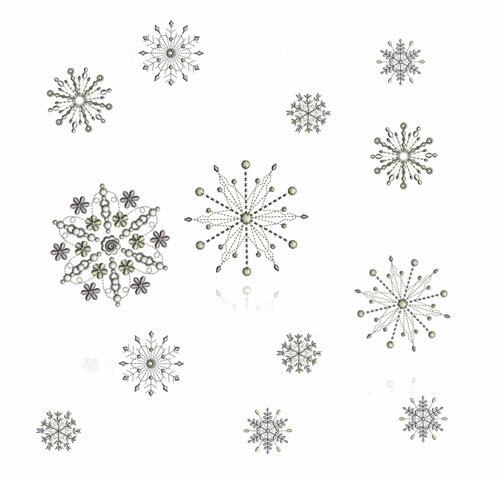 As I have just released my Graceful Snowflakes 2014 I wondered if they could be adapted to place on a card! With all the heavy snowfall in the USA I am not sure that their arrival was good timing! I had such fun creating them though I hope that I am forgiven. 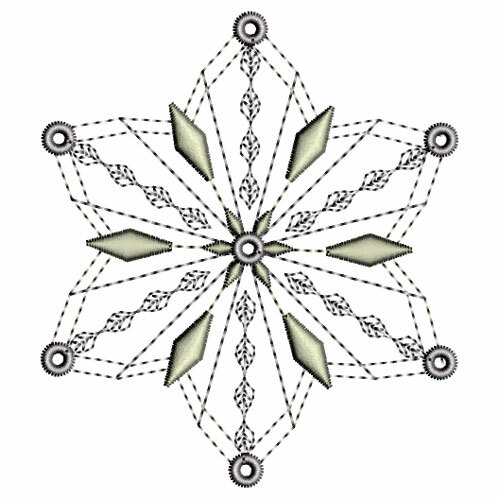 As with last years collection of 12 snowflakes I decided to create some very unique ones using elements from some of my existing Embroidery collections. You will find a snowflake for Le Bebe Royale, another one contains the little flowers from Pamela’s Joy, one based on the Embroiderer’s Prayer and a few others which feature elements from future collections due to be released in 2015. The remainder of this set contains snowflakes that are more traditional as I have used actual snowflakes photography as my inspiration. It is amazing that no two snowflakes are the same and so I love to look at the superb images that clever photographers have captured. I hope that I too have placed some of that intricate beauty into my designs. Looking through the 12 designs I need one that will fit into the oval or circle of a card. The snowflake shown above is my favourite in this set, but I am not sure it will be suitable as it only has running stitches around its edge. 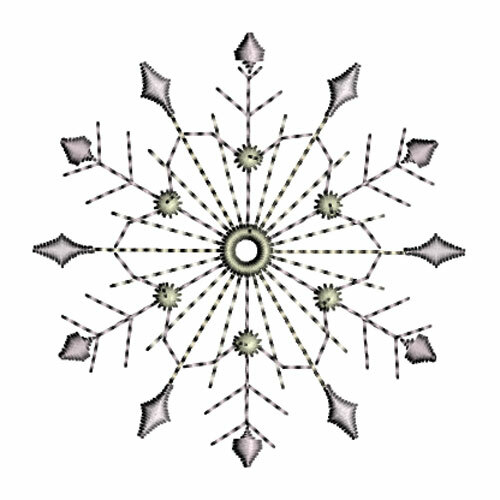 I also want to embellish the snowflake with crystals so perhaps a simpler snowflake would be a better choice. Maybe this will be a better snowflake but from past experience it would be better to stitch out a few snowflakes on organza using wash away stabiliser and see which looks best when dried and carefully pressed! I will go away and do exactly that and let you know how that goes. In the meantime you may want to preview my snowflakes for some seasonal projects like tree and table decorations. This entry was posted in Embroidery projects. Bookmark the permalink.